It takes some skill, impressive technique and supreme self-confidence to sidefoot a goal from 35 yards with the entire opposition team lined up between you and your target. Fortunately for Posh, Marcus Maddison has those attributes. His delicious swerving, spinning set-piece careered into the Wigan net off the inside of the post 10 mminutes from time to earn an unlikely point, end a miserable run of five straight defeats and, partially at least, lift his team out of the doldrums. This season has been a tale of the unexpected across the top four divisions of English football. Anyone claiming to have predicted the current leaders of the Premier League, League One and League Two is either a psychic worthy of Mulder and Scully’s interest or a fibber. Wigan’s place among the promotion contenders in the third tier is less surprising. Their 14-game unbeaten run into top two might not have captured the attention of a town far more well known for their rugby league prowess - there were 12,000 empty seats in home areas yesterday (March 5) - but the FA Cup winners of 2013 are armed with enough in paracahute payments to have a clear financial advantage over the rest. They’ve used it to build a side with enough power, pace and strength to return to the Championship at the first attempt and this blip is unlikely to stop them. On all known recent form Posh should have been lambs to the slaughter. Instead they played the roles of coupon buster with a performance which was plucky and brave in the main, but with patches of the quality passing football on view far more regularly before Christmas. Wigan should still have won. They were poor for an opening quarter dominated by Posh, but saw enough of the ball, particularly in the second-half, to have emerged victorious by a couple of goals at least. They didn’t because of some fine goalkeeping from rookie Stuart Moore - his last-gasp effort to stop Will Grigg claiming a second, match-winning goal in the final minute was a cracker - and some excellent defending in and around the penalty area. One suspects Gaby Zakuani took defensive coaching this week because his trademark diving block was employed by Jack Baldwin and others in this match. Posh were also assisted by Wigan’s poor finishing. In Yanik Wildschut they have a marauding menace full of speed and purpose. He sprints past full-backs with ease, but he missed two sitters, one in each half, which could well have sealed three points for his side, side-footing wide from 12 yards after being teed up by Conor McAleny before the break and slicing horribly wide after bursting clear midway through the second period. Posh defended with enough organisation to ensure many of Wigan’s multitude of shots were taken from outside the area, Those that did breach the defence were mostly well handled by Moore, although he had to recover smartly to stop Grigg from netting a 20th minute opener after spilling a strike from much further out from former Posh skipper Craig Morgan. Grigg eventually did open the scoring 20 minutes from time after finding himself all alone in the penalty area after Jon Taylor had lost possession. Posh collapsed after conceding at Bury in their previous game, but rallied well here, enabling Maddison to both win and convert a match-saving set-piece. Maddison has been a one-man attacking tour de force in recent weeks. His theatrics and tantrums are reminiscent of Lee Tomlin and so irritate greatly, but he will be responsible for the last four Posh goals once the ‘dubious goals’ panel rule in his favour over the identity of the scorer againt Oldham at the ABAX Stadium last month. That is encouraging, but it’s also a worry. Posh played some neat and tidy football at the DW Stadium, and Shaquile Coulthirst was an eager worker in a lone striking role, but there is currently little alternative threat to Maddison. He created the best Posh chance in the first half with a delightful chip that Michael Smith volleyed goalwards, only to see the onrushing Taylor divert over the crossbar, and he missed a glorious opportunity to score early in the second-half when a heavy touch enabled substitute goalkeeper Lee Nicholls (first choice Jussi Jaaskalainen was injured early on) to rush out and block. For the second game in a row Maddison left a full-back bemused and embarrassed by flicking a ball over his head before racing into space. No wonder opponents tend to resort to fouling him and thank goodness he’s improved his attitude to team play and forced manager Graham Westley to select him. Westley’s intial team selections and substitutions have come under scrutiny during the dismal run of form, so much so his nickname could soon change from ‘medals’ to ‘meddles’. He restricted himself to four changes to the starting line-up for this game, but there was still a nod to eccentricity by selecting centre-back Baldwin at right-back and right-back Smith at left-back. Baldwin’s positioning was all down to containing Wildschut which he did well enough until collecting a first-half caution which forced him to tread far more carefully. Westley is also unafraid to make changes during a game that others wouldn’t contemplate, His reaction to falling behind here was to ignore recent striker signing Tom Nichols and adventurous midfielder Adil Nabi and instead send on defensive midfielder Callum Chettle, recently of Nuneaton Borough and with six minutes of Football League experience under his belt. It worked as Chettle kept the ball well enough against players of the calibre he’d only seen previously on TV. There was a shift in club policy though in the arrival of 30-year-old Simon Gillett on loan from Yeovil. In size and demeanour there is more than a hint of Dean Keates in the newboy and his debut at the base of the midfield diamond was decent. 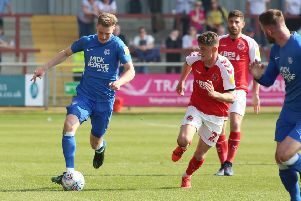 Gillett, whose signature might just point to the continued absence of Chris Forrester in the coming weeks, is the 40th different player to make a Football League appearance for Posh this season which is only partially explained by the club’s injury curse. There was a surprise after the game as well as Westley conceded that the ‘play-offs might now be out of reach’. His team are 16th so he’s probably right, but he’s never been less than bullish abaout his side’s chances of a storming finish. In a far from vintage League One campaign Posh it’s disappointing promotion is ruled out with 11 matches to go, but hopefully some momentum will be achieved in the next eight weeks to take into next season. Goals; Posh - Maddison (81 mins). Wigan - Grigg (71 mins). Cautions: Posh - Baldwin (foul), Beautyman (foul), Maddison (dissent), Gillett (delaying the re-start). Attendance: 8,877 (409 Posh fans). Alan Swann is at the match for the Peterborough Telegraph so follow all the team news, LIVE commentary, match report and match reaction here click here. Also follow @PTAlanSwann on Twitter for live match updates.